Andy reports an excellent day working on the Q6 on Saturday, though rather cold, with the best turnout of members to date he thinks. There were a total of eight enjoying the fun, these included Iain Corduex, James Pearcy, Neal Woods, Trevor Wilford, Peter Ellis, Brian Armstrong, Ian Pearson and Andy himself. Everyone was managed so as to be kept in a job spread all round the engine, with some good progress achieved and some jobs completed. Iain, James & Neal were kept very busy with cross heads alignment, a most interesting day with lots of measurements taken from the wire set up on the centre line of the cylinders. See photo 4383 ‘the three wise men’. He was pleased they can still have a good laugh after such a cold day on the wire. 'Good progress lads keep it up, the learning curve will not be so steep with the knowledge gained so far'. 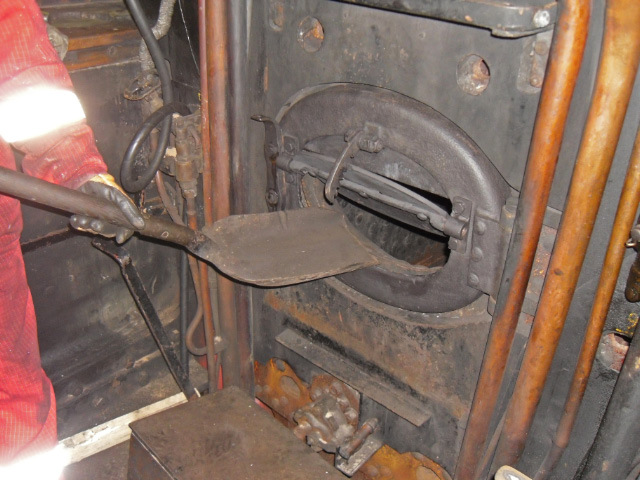 Trevor has finished the fire hole door with a new flap and hinges fitted. See photo 4385, testing the flap with the shovel. He then put the holes in the new steam chest cover plate and cleaned up the studs. 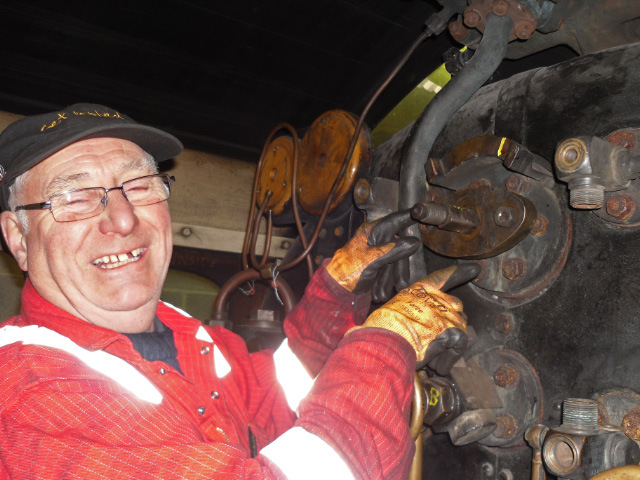 Peter has completed the axle box pipes on the leading axle and refitted all the annealed pipes to the cylinder lubricator. 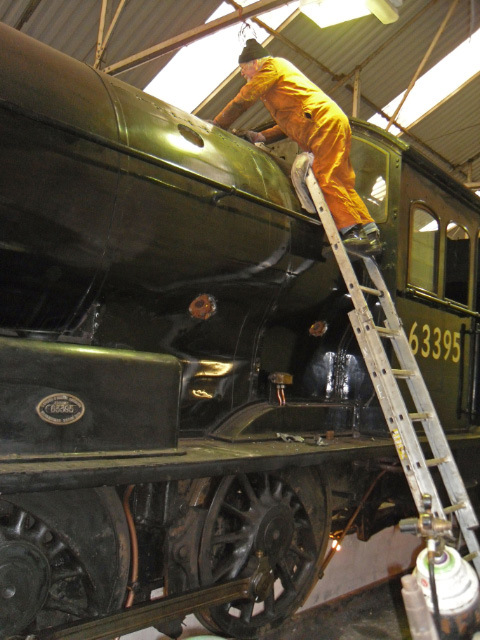 Brian was on top of the boiler cleaning the studs, nuts and old gaskets from the whistle & safety valves. This was a very time consuming job as access is not easy Andy was very grateful for his dedication, see photo 4376. Ian has pulled all the packing out of the regulator stuffing box and replaced with new see photo 4384. Andy finished off the safety valves with Neal checking the clearances as a double check. He was also kept busy sorting out jobs as they progressed and tried to sort out future work to keep the enthusiastic workforce busy. Finish cleaning grooves in piston heads and file a small radius on top edge of grooves. When finished, move both pistons to front of engine and stand up on woods. Fit both valve covers, make sure faces are clean and copper washer in place. Fit 12”X12” plywood over sand box covers in the cab to prevent them being filled. Remove the split pins and nuts from the left leading horn stay bolts that are marked up in yellow paint, and then tap the bolt to see if it is loose. Remove the intermediate axle box oil pipes etc., mark up and put into storage as was done with the leading axle. There are another four flexible pipes on order - thanks to Steve Hyman for sorting out the manufacture and collection of these.